What could be sweeter than the sweet taste of Strawberry Honey Butter. Whip up a batch to keep in your fridge, its such a special treat. What could be sweeter than the sweet taste of Strawberry Honey Butter. This butter is just delicious and a real special treat. It is so easy to make and will stay good in your fridge for 1-2 weeks. This would be a real sweet treat for a special breakfast in bed. Birthday breakfast, Valentine’s breakfast, Easter breakfast, or a good old lazy Sunday morning breakfast. Make a batch to keep in your fridge, your kids are going to be hooked. You can use organic ingredients if you like. Homemade rocks store bought any day! This recipe is so quick and easy but shhhhhh no one will be able to tell. 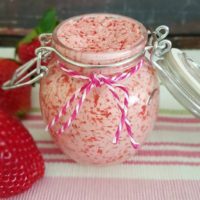 This strawberry honey butter is so sweet & delicious. Puree the strawberries in either a food processor or blender. Once blended push strawberry puree through a strainer and into a medium sized pot. Add honey and lemon juice while bringing to a boil. Boil for 3 minutes, stirring constantly, until slightly thickened. 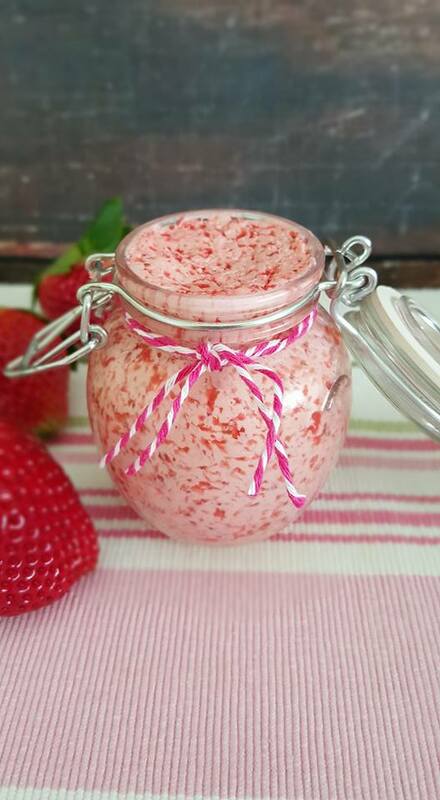 Once cooled, mix with a hand mixer, your cooled strawberry mixture and the softened butter. Once blended I also used the back of my rubber spatula to push/mush the butter and strawberry mixture to make sure it was blended well. Can be kept in the fridge for 1-2 weeks. It probably will not last that long. I can’t wait till you try it. Your kids will love it too! Does this have to be refrigerated right away or not until after it’s been sealed and then opened? I would not keep it out of the fridge for longer than 6-8 hours after making it. After that, you should get it into the fridge. can you use fresh whole strawberries that have been frozen? I live in Australia and I would like to know how much is 1-1/2 sticks of butter? In weight? It also measures out to 12 Tbsp. I had to use this same measurement tonight for butter cookies and looked it up. Can this be stored in the freezer?